A compare and contrast essay is a form of academic writing that is built around an examination of at least two items. There are two kinds of compare and contrast essays: one where you focus more on the similarities of chosen items, and one that contrasts their differences. Depending on your emphasis, the paper can be more of a comparison essay, or more of a contrast essay. Decide on the two or more items you plan to discuss. Make sure they have similar and dissimilar qualities, so there is enough material to focus on. Make an outline, sketching out the points you plan to focus on in your essay. 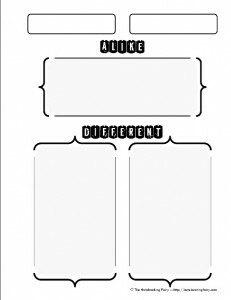 Decide which organizational structure you will use for your compare and contrast essay. There are two basic approaches for the main body. You can either focus on the similarities first and then go to the differences (it can be in reverse order as well)—this is called point-by-point arrangement; or you can first focus on the qualities of one item (in a paragraph or two), and then move onto analyzing the other item (normally comparing the same set of qualities)—this is called a block arrangement of ideas. Write an introduction. Make sure to finish it with a clear thesis sentence where you give the main reason for choosing whichever items you chose. Write a conclusion. Make sure to go back to your initial thesis sentence and rephrase it, finalizing the result of your comparison or contrast writing and answering the main question you initially had in mind. Lay your essay aside for a day or two and then thoroughly proofread it. There are limitless points you can compare or contrast in your essay. It can be anything related to natural phenomena, food, lifestyle, sports, gender issues, hobbies, literary forms and so on—anything people can have viewpoints on. The only concept you have to consider when choosing the subjects for your compare and contrast essay is that what you compare or contrast needs to be of the same kind, type, or category, which means they need to have some basics in common. For instance, you cannot compare a tornado to being a vegetarian, or a movie to the choice of a profession. Below are several examples of topics for a compare and contrast essay. Halloween or Christmas: which holiday is more fun? Acting and lying: are they really the same thing? Why public schools are better for children than private schools? Dieting and anorexia: are they really that far apart? Forward or defender: which soccer position contributes more to a win? Which is a better place to go on vacation: the beach or mountains? The main rule when writing compare and contrast essays is paying attention to details. The items you compare might be what we do or watch or talk about every day. You have to take your time, brainstorm for ideas and take a fresh look at the subject you plan to discuss or come up with a different perspective from the one you normally have. The key to a successful compare and contrast essay is following the selected organizational structure (either block or point-by-point) precisely, since this is normally one of the main criteria your instructor will check when grading the paper. Think of a particular audience you are addressing. Sketch the list of major qualities or peculiarities of this audience and make sure you address the subject that is important to your readers, noting what your audience normally values and is interested in. When making an outline for the items you chose to compare or contrast, ask yourself this question: “Will the result of your comparison have any significant practical value or meaning for you or your readers?” If the answer is “no,” then it is better to change your topic at this point. Do start your essay from a clear definition of each of the items you plan to compare or contrast in your essay. Do make sure to research the subject before you start listing its qualities. The facts and data you use have to be up-to-date and relevant. Do try to follow a particular structure for each paragraph, depending on the arrangement type you initially chose for your essay. Start each paragraph with the general idea (usually, a certain criterion you would like to apply when analyzing your items), then introduce supporting details and finish with a general conclusion. Don’t try to combine two organizational structures—select one of the two and stick to it throughout your essay. Don’t forget about using transitional words. In compare and contrast essays, they not only smooth out the flow of your writing, but also serve an additional important role of indicating to the readers that you are switching from one item to the other one. Don’t get subjective. Even if you have a clear preference for one of the subjects you are contrasting or comparing, it is important to remain objective and base your conclusions on factual data rather than on your personal emotions. Don’t ignore general academic writing requirements while trying to follow specific rules for writing compare and contrast essays. Make sure your paper is written in a formal style, avoiding slang and conversational language; ensure that your essay has no spelling, grammatical, or punctuation mistakes. – Starting your essay without a clear idea in mind. You need to decide whether you will focus on proving the similarities or the differences of the items you compare, and only then can you move onto creating an outline and starting your draft. – Choosing a topic that is too general or is widely discussed. It is difficult to create an original and plagiarism-free essay when you select a topic that has already been discussed a million times. – Selecting two equally good/bad/useful/advantageous items to compare. If you yourself cannot answer your thesis question (“Which item is a better choice?”), then you will fail to produce a successful compare and contrast essay. – Using charts or tables in your paper. Despite the fact that it might be easier to list similar or discrepant qualities by organizing them into some sort of graphic structure, this is not an appropriate idea when you are writing an essay. You can still create a chart or a table for your own purposes to help you organize your thoughts and prepare a outline. Now that you have acquainted yourself with the basic compare and contrast essay writing tips and rules, you can check out our compare and contrast essay samples to link theory with practice.